Nathan Eide: Beef with bacon. Do you need anything else? Beef with bacon. Do you need anything else? After lying in bed the vast majority of the day trying to find a comfortable position for my spasming lower back, I finally got up and started dinner. On the menu tonight, six ounce sirloin fillets wrapped in thick-cut bacon, courtesy of Von Hanson's Meat Market. Typically I prefer to season my steaks with sea salt and a cracked peppercorn melange. However, on this occasion, to shake things up I reverted to my childhood. There are a few schools of thought in the realm of steak seasonings (other than unadulterated beef, of course), the majority fall into either A1 or Heinz 57. Growing up, we rarely used the 57, and NEVER touched the A1. 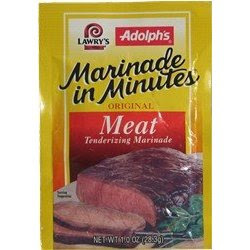 Instead, we went for the always classy Adolph's Marinade in Minutes. Pierce the meat a few times on each side with a fork, mix this packet with 2/3 cup cool water, whisk briskly, set 1/4 cup of the marinade in the fridge for later and let the meat soak in a ziploc for 15 minutes. 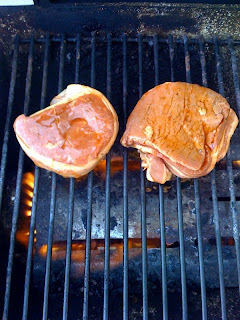 Take the steaks, toss them on a ridiculously hot grill for six minutes a side (these were about 1 1/2" thick), let them sit for a couple minutes off the grill while you finish prepping the rest of the sauce. With that 1/4 cup of marinade you set in the fridge, you are on your way to steak sauce nirvana. Simply whisk and nuke for 60 seconds and you have a fantastic dipping sauce for those wonderful cuts of meat. My sirloin fillet was served with a traditional baked potato (with salt, pepper and butter), while Michelle decided upon a salad of mixed baby greens, cucumber, broccoli florets, baby carrot, baby bella mushrooms and Marie's Premium Super Blue Cheese dressing. For dessert, we opted for a Market Pantry strawberry picnic cake with waves of buttercream icing topped with sprinkles of some sort of "strawberry" candy. Frankly it was reminiscent of FrankenBerry or Crunch Berries. Too sticky sweet and not very good. However, there's something appetizing about sitting in bed, having dinner while flipping back and forth between Intervention and American Gladiators, before finally settling on THS: Heath Ledger. Well, okay, maybe not, but that's what was on. Crappy TV night until we caught the replay of the Project Runway season five premiere. More on that later. Big Bowl on the house!